iPads and other tablets have progressed to the point where, frequently, you can leave your laptop at home. The real limitation of these mobile devices is inadequate storage space to carry all of your files. Seagate’s Wireless Plus deftly solves this problem. The Wireless Plus drive is battery-powered and creates its own Wi-Fi signal so that your smartphone or tablet can connect to it when you’re on-the-go—in a car, on a plane, at a conference, or somewhere off-the-grid. Ample storage connected via Wi-Fi and battery power solve the biggest hurdles to mobile computing. This compact 3-1/2″ x 5″ drive has a one-terabyte capacity so you can carry nearly everything you need while away from home—reams of paperwork, thousands of photos, movies, your music library, and more. 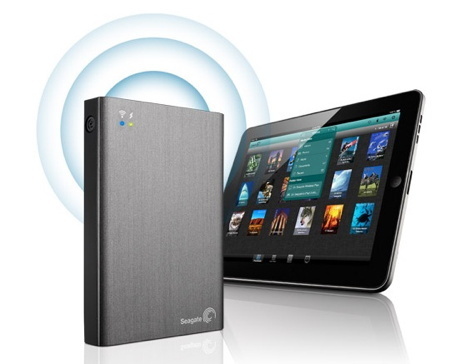 Because it’s wireless, you can leave it in your bag and its contents are available anywhere within a 150 foot radius. You can password-protect its signal (with WPA security) or you open it to share it with up to eight others simultaneously. Imagine what an impressive convenience this can be at a business meeting. Seagate has thought through compatibility quite thoroughly. The Wireless Plus is compatible with Wi-Fi enabled devices with a web browser; Mac OS X 10.6 or higher, Windows (8, 7, Vista, XP), iOS 4.3 and higher, Android 2.3 and higher, and the Kindle Fire. 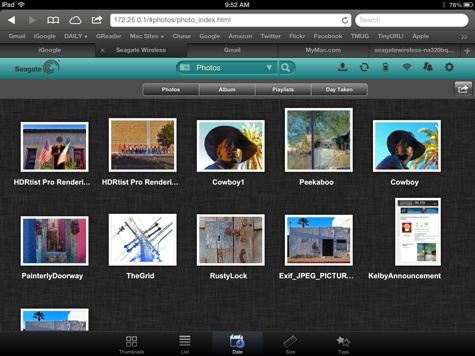 Mobile devices require the free SeagateMedia app downloadable from the App Store specific to your device. The drive includes a USM (Universal Storage Module) SATA connector and a USB cable for connecting the drive to your computer. Once connected, moving files onto the drive is a simple drag-and-drop procedure. There is also a small power brick for charging the drive. Charging takes up to three hours and provides up to ten hours of use per charge. Included with the drive is a skimpy quick-start guide that is all you really need to begin, but if you go to the Seagate site, http://www.seagate.com/support/external-hard-drives/portable-hard-drives/wireless-plus/, there is an essential 40 page manual, a copy of which should really have been included. For a hardware item this costly, omitting a printed manual seems needlessly chintzy. Seagate Wireless Plus supports Safari, Firefox, and Chrome as well as Webkit for Android and Explorer for Windows. The file types that can be read by the drive include documents from Microsoft Office, some iWork files, and Adobe Acrobat (PDF). It will play most audio formats: AAC, MP#, M4a, AIFF, WAV, Apple Lossless, and Audible as well as MPEG-4 and H.264 video. Seagate states that the drive will also work with select file formats supported by third-party apps. 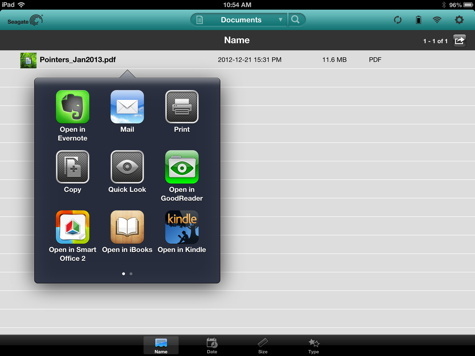 Depending on the apps installed on your device, the SeagateMedia software offers many options for opening a file. A few fail; as an example, FileMaker files residing on the Wireless Plus are not recognized even when the mobile FileMaker Go is installed on an iPad. Future updates will undoubtedly add accessibility to some of these more popular applications. If you like the idea of being completely untethered while using your mobile devices, the Seagate Wireless Plus is worthy of consideration. The ability to bring along most of your digital life and access it wirelessly without the need for power is liberating and feels almost magical. The issues discovered with the precursor to this box: once logged on wirelessly you were unable to access the rest of your network: this is a single node among other nodes visible to your devices in range. It does not function as a Network Attached Storage (NAS) device, which would be ideal. 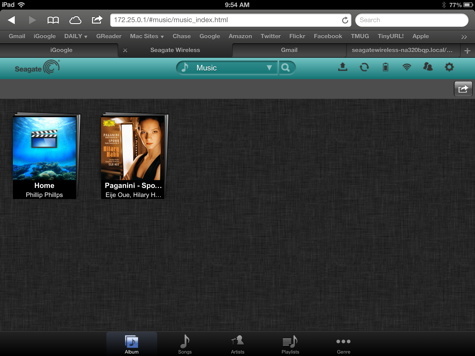 Also, notice the user-interface in the images above: as I recall, one accesses the media through the unique browser provided by Seagate: iPhoto could not access the images and videos contained; iTunes the music. If Seagate has found a way to allow the actual OEMs to pass the data stored through their respective apps, Mac, Windows, etc., then this device may be deemed “killer”. Otherwise, buyer beware!